I’ve cut this plank three times already…and it’s still too short! If you are working your tail off and your productivity begins to drop off, you might think…time for a vacation! 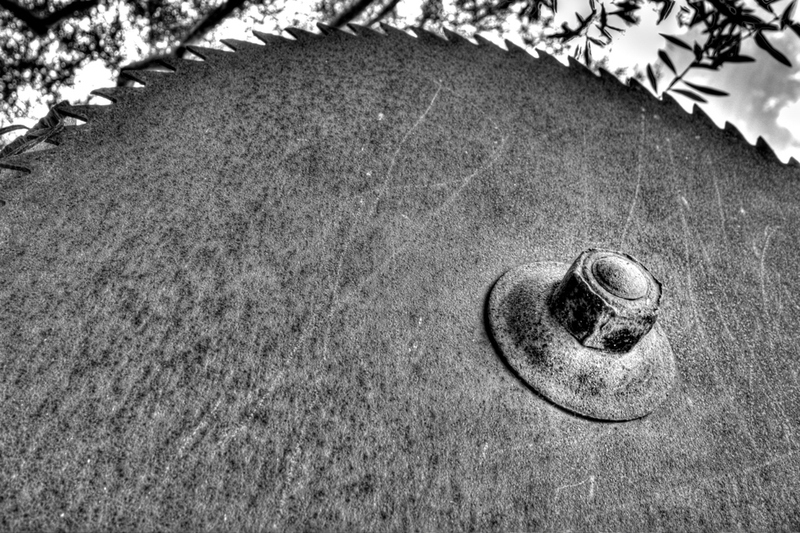 This is not sharpening the saw, it is putting down the dull saw to be picked up when you get back from your getaway. In order to sharpen your saw you should engage in a renewal activity such as exercise, healthy eating, education and seminars, learning a new skill, meditatation, maybe writing a journal or just having a long meaningful talk with someone. Are your blades (knowledge, body, mind, motivation, spirit) still honed to perfection? If not, find the ones that are dull and take some time to sharpen them! This is from our favourite rusty haunt, Bernardo Winery. The blade here was used for ripping lumber and was attached to a series of gears and pulleys which were likely driven by a linkage to tractor. Using a wide-angle lens and a low perspective, the scale of the blade is accentuated. Compositionally, the center mounting point is placed in the lower right third of the frame (Rule of Thirds). One can even get trickier and use the rules of Fibonacci Composition, which in itself is rather fascinating! Photographers, look up Fibonacci and sharpen up your compositions! It is good to remember that one of our goals in life is to not be perfect. If life is about experimenting, experiencing, and learning, then to be imperfect is a prerequisite. Life becomes much more interesting once we let go of our quest for perfection and aspire for imperfection instead. This doesn’t mean that we don’t strive to be our best, but to simply accept that there is no such thing as perfection. Perfection may happen in a moment, but it will not last because it is an impermanent state. In spite of this, many of us are in the habit of trying to be perfect. One way to ease ourselves out of this tendency is to look at our lives and notice that no one is judging us to see whether or not we are perfect. Sometimes, perfectionism is a holdover from our childhood—an ideal we inherited from a demanding parent. Now that we are the adults, we can choose to let go of the need to perform for someone else’s approval. Similarly, we can choose to experience the universe as a place where we are free to be imperfect, where we can begin to take ourselves less seriously and have more fun. 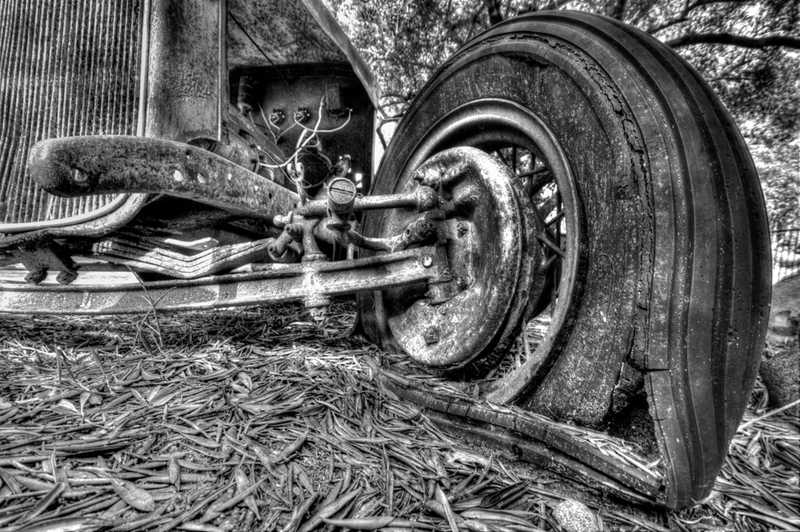 This is another rusty gem from the grounds of Bernardo Winery – oh, did we mention that they have spectacular vintages as well? Rusty things are just fun to explore and shoot. 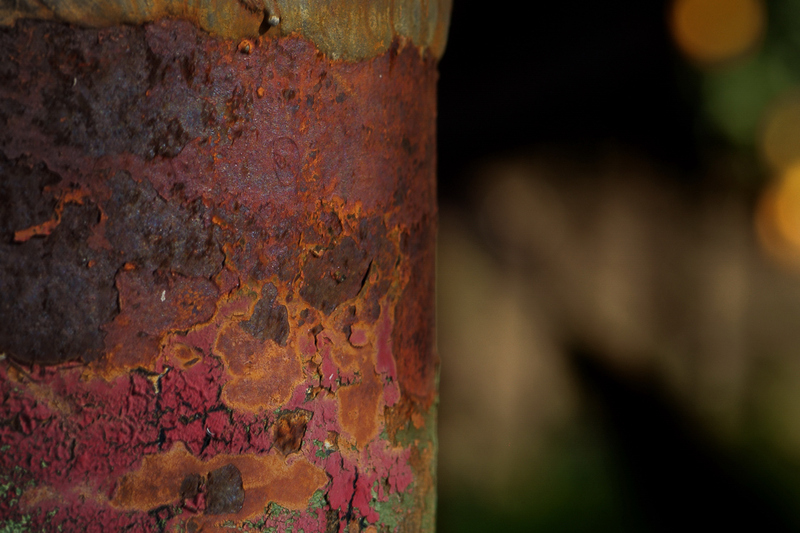 Here we used a Nikkor 105mm fixed focal length lens (that also doubles as a Macro) allowing us to get up close and personal with our favourite form of oxidation. Having a tripod for Macro work is not a luxury but absolutely essential. The closer one gets, the more critical the focussing becomes and hence, the stability of the camera. In the “old days” of SLR cameras and film, viewfinders often had split image focussing and other optical aides to get that tack sharp image. Now, we always take off the Auto-Focus feature and focus by eye and forget about the camera making choices for us. Also, using a remote shutter release, wired or infra-red, helps minimize vibrations when releasing the shutter. If you want even less potential vibration, you can use the Mirror-Up feature after composing and before shooting (yes, the movement of the mirror to expose the sensor causes the camera to shake). We all experience frustrations each and every day. Our expectations go unmet, our plans blocked, our wishes go unfulfilled…we discover that our lives are subject to forces beyond our control. The tension that permeates our bodies and minds when we are late for an event, interrupted at work, or sitting in traffic can interfere with our well-being in profound ways. The small frustrations and irritations wield such power over us because they rob us of the illusion of control. However, every problem is a potential teacher—a confusing situation is an opportunity to practice mindfulness, and difficult people provide us with opportunities to display compassion. There is a natural human tendency to invest copious amounts of emotional energy in minor frustrations in order to avoid confronting those often more complex issues on our plates. It is only when we let the little stuff go that we discover that the big stuff is not really so devastating after all. This image was shot at Bernardo Winery in San Diego, California. 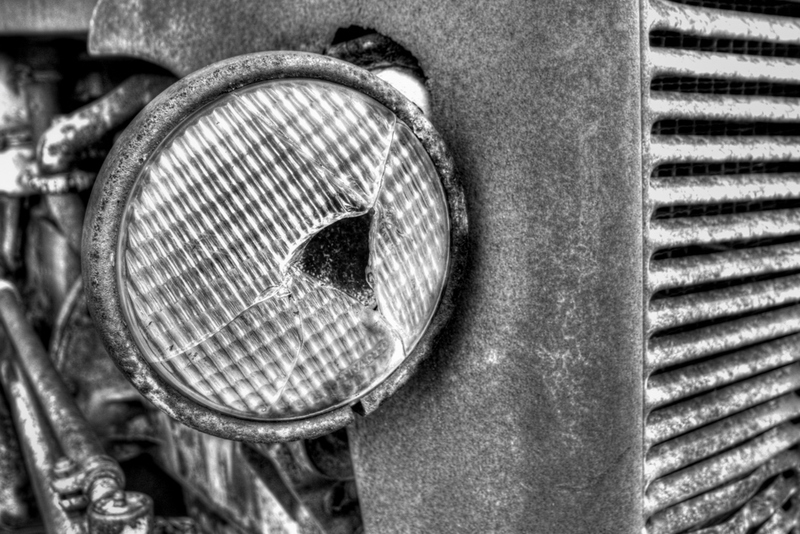 The number of rusty vehicles, farm contraptions and other curious objects can keep a photographer occupied all day! The Winery is host to many Weddings and Engagement Parties and is an excellent venue for couples portraits or some fun Vintage Photo sessions! Taken with a Nikon D90 DSLR equipped with a 10-20mm wide-angle lens, it was important to maintain stability, even with reasonably fast shutter speeds. For this, we almost always use a tripod. Not only does this prevent the camera from inadvertently moving during shutter release, but it forces the photographer to slow down and compose the vision. This was shot at the Bernardo Winery. They have a wonderful selection of Wines, comparable to Napa! The Owners allowed us to roam around and shoot their location. This place is photographers Dream. 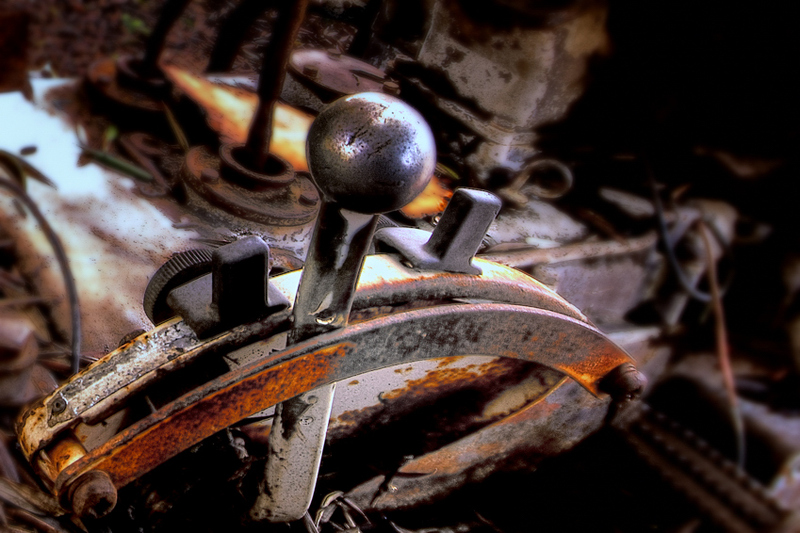 There are rusty Tractors, Trucks, Mechanisms, and cool stuff everywhere. This is a great place for Portrait, Engagement, Family Sessions. With Off Camera Lights close to sunset, everything just “pops” and is spectacular! In Photography is in out-of-focus areas of an image, or “the way the lens renders out-of-focus points of light.” Differences in lens aberrations and aperture shape cause some lens designs to blur the image in a way that is pleasing to the eye, while others produce blurring that is unpleasant or distracting—”good” and “bad” Bbokeh, respectively. Bokeh occurs for parts of the scene that lie outside the depth of field . Photographers sometimes deliberately use shallow focus technique to create images with prominent out-of-focus regions. This is great for Portraits. This was shot at the amazing Bernardo Winery. Wine to White Lightening from the Bernardo Winery in San Diego? I am not saying that during Prohibition that the Bernardo Winery “fortified” their Wine, but I do know that this is quite easy – my Father produced many gallons of Valge Valke (Estonian translation for White Lightening) and it was somewhat strong! You may recognize The Ball Mason Jar now used in many Bars (and for Pickling). 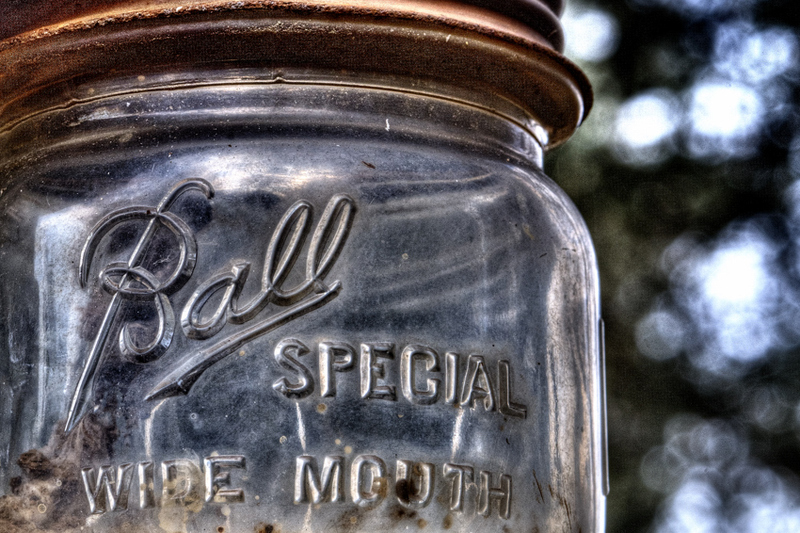 The earliest glass jars were called wax sealers, because they used sealing wax, which was poured into a channel around the lip that held on a tin lid. This process was complicated and error-prone, but was largely the only one available for a long time, and widely used even into the early 1900s. These jars were later used by entrepaneaurs transporting Shine during the Prohibition. The drivers would customize their cars engines, transmissions, shocks etc in order to keep ahead of the FBI. This was the birth of National Association of Stock Car Auto Racing or (NASCAR)…. Funny how things evolve! Warp Drive is a faster than light (FTL) propulsion system in the settings of many Science Fiction works, most notably Star Trek. A spacecraft equipped with a Warp Drive may travel at velocities greater than that of Light by many orders of magnitude, while circumventing the relativistic problem of time dialation. This was shot at Bernardo Winery in San Diego – this place is a gem for local Photographers, loaded with all manner of artifacts. This is a control panel for adjusting DC Voltage and Current. 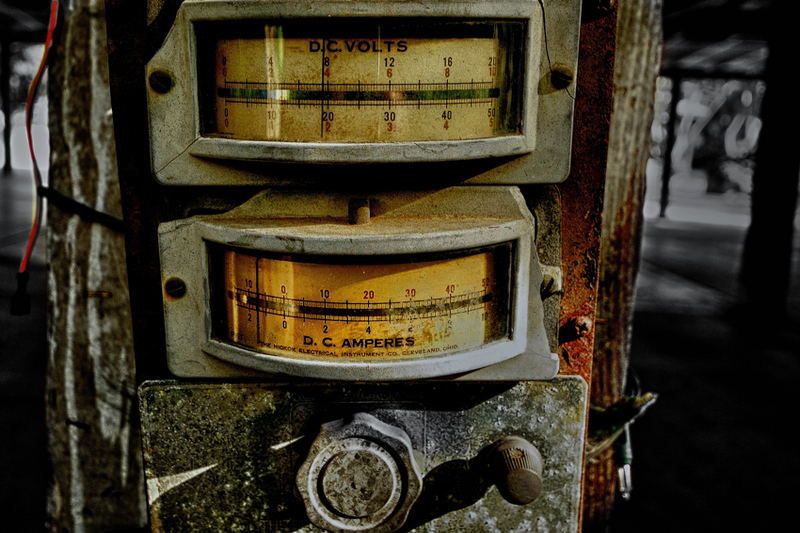 The large knob at the bottom likely switched the ranges of the Voltage and Amperage Scales, and the knob to the right pehaps did some fine tuning. I think this may have been for an electric fence or maybe millitary gear?